Screen grab from YouTube video. 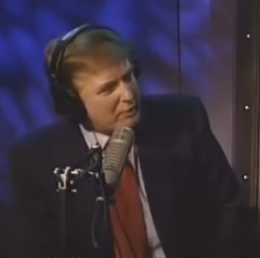 In 1997 on the Howard Stern show Donald Trump compared the danger of contracting an STD while dating to being in Vietnam and refers to himself as a "great and very brave soldier." Those who have already decided that they will vote for Trump will dismiss/excuse this, too...as they do with all of Donald's low-class behavior. They'll call it irrelevant, petty, trivial, a waste of time. That's OK. I'll keep uploading more videos because the people who haven't already decided who they're voting for need this kind of information...which is why I do it. going to vote for. I'll bet many of your friends won't feel very good about having to dismiss or excuse ALL of Donald's disgusting behavior that I've chronicled on this YouTube account. Donald: It is a dangerous world out there. It's like Vietnam...sort of like...the Vietnam era. Howard: It is your personal Vietnam, isn't it? Donald: It is my personal Vietnam. Howard: You've said that many times. Honestly, I don't know how anyone can or would even attempt to excuse all of that behavior from someone they think can make America "great." Only a "great" man could do that. And, the evidence on that YouTube channel proves that Donald Trump is NOT a great man. He's a very poor excuse of a male and he certainly does not possess the qualities that great men or great presidents or great countries are made of. This post has been updated to address an audio issue with the original video.